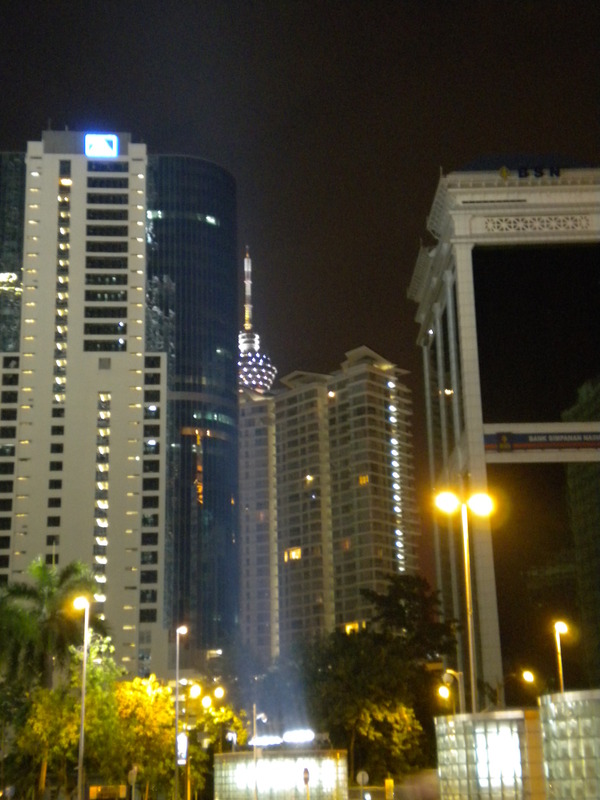 Yesterday night, another night for outing at KL again, it seems like once for every week, that is on Saturday’s night. 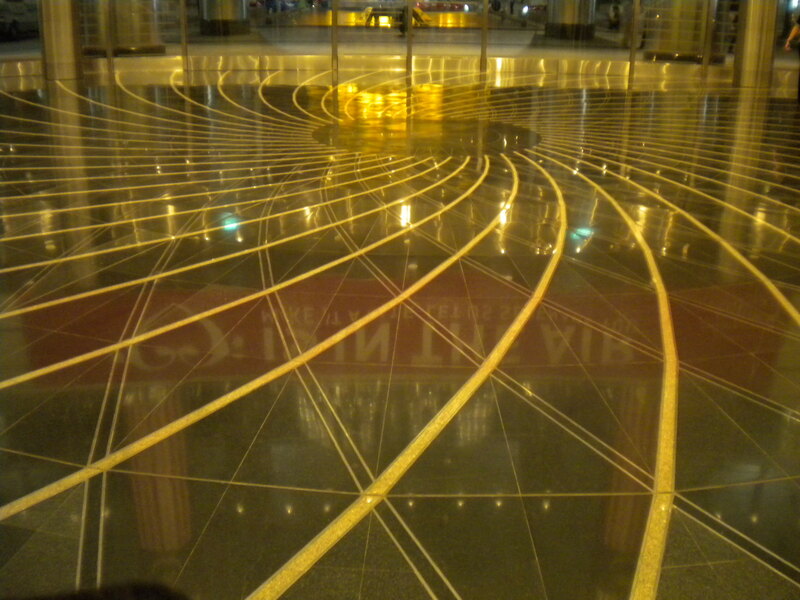 This time around, we went to Pavilion KL, the latest shopping mall in KL. It is raining out there, and in the car, I can still see many people walking around the Bukit Bintang area, or commonly known as Golden Triangle of KL. This is what we call tourist hot spot. We went for a delicious dinner at Dragon-I Restaurant in the mall. There are so many other choices of restaurants or cafes in the mall, especially at Level 1, but I decided on Dragon-I. Name seems to be very cool, as well as the design of the restaurant too…haha…First time eating at Dragon-I and I definitely like the Ramen, Shanghai Xiao Long Bao and the Mango Sago Cream (pudding like). Next, we went shopping a while, yes, a while, since the shops will be closed by 10pm…it’s too early, the time should be extended further to cater for more tourists at late night. Oh my god….first time shocked to see the prices of shirt on sale in the mall…every brands are famous and expensive…one simple T-shirt could costs you over RM500!! Yes…it’s over RM500 for a simple T-shirt (I repeat again). I see some nice shirts, but of course, not affordable and not worthy to buy. Finally, we went for a movie, and it’s Prince of Persia. The main character whom is the Prince Dastan, is acted by the one who acted as the boy in The Day After Tomorrow (I forgot his name). The story is quite good, since it is based on a video game, but somehow lacks of some logic. The effects like in term of visual and sound especially the background setting are very fascinating. This two-hours movie is worth a watch too, but only a watch, not twice or more. It is good anyway. Okay, my whole night is spent on this….coming back home, feeling too tired at around 2am…so slept already…Sunday is definitely dedicated to assignment again! 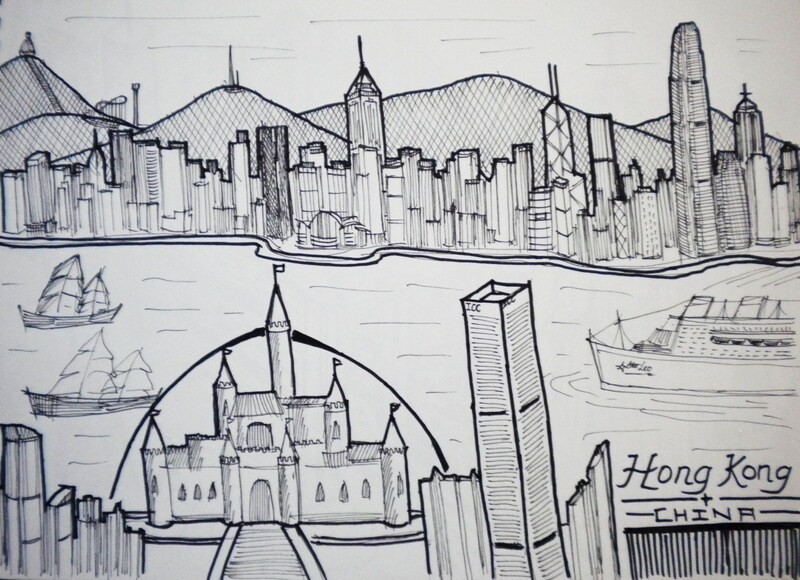 Sketches: New York City and Hong Kong. Today morning before continuing on my design assignment which is to build final model with site, I suddenly had inspiration to sketch something, not of design, but of cities again like the one I posted in my previous post. 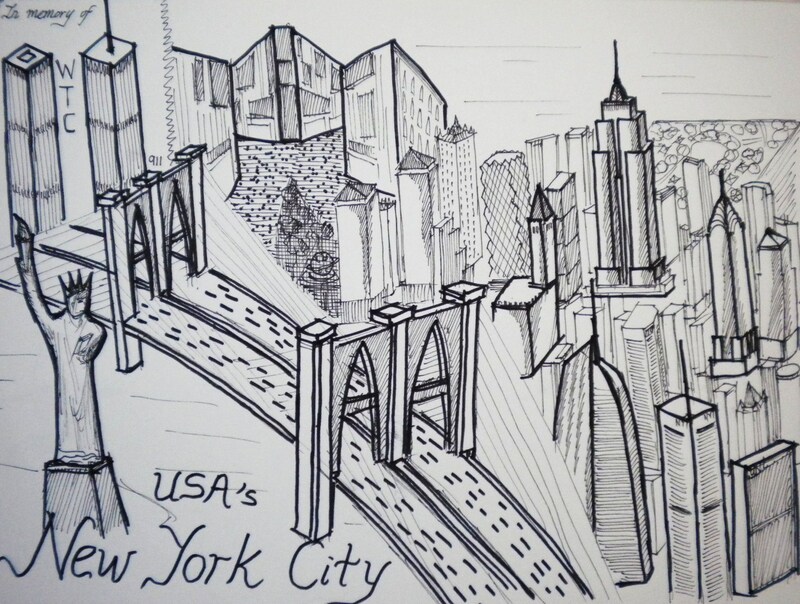 This time around, I had able to sketch on New York City of United States of America and Hong Kong of China. Both cities are well-known and play important role in world economy. Furthermore, I know more on these two famous global cities, so I decided on sketching both. For New York City, you will find Statue of Liberty, Brooklyn Bridge, Central Park, Empire State Building, Chrysler Building, Trump Building, Bank of America Tower, New York Times Building, United Nation Headquarter Building, Hearst Tower, New York Times Square as well as a section in memory of World Trade Center destroyed in 911. These are famous landmarks of NYC. For Hong Kong, you will find the beautiful skyline of Hong Kong Island consisting of famous skyscrapers like Central Plaza, Bank of China Tower, Cheung Kong Center, The Center, Two International Finance Centre as well as the Hong Kong International Conference and Exhibition Center. Besides that, the recently completed International Commerce Centre (ICC) is also shown in the sketch, alongside with Nina Tower, Hong Kong Disneyland (Sleeping Beauty Castle), Ocean World, and famous Tian Tan Buddha statue. That’s all for the day…should be getting to the hectic assignment by now….before that, Happy Wesak Day to all Buddhist around the world..including me, myself….it’s birthday of Siddharta Gautama Buddha, the founder of Buddhism teaching. 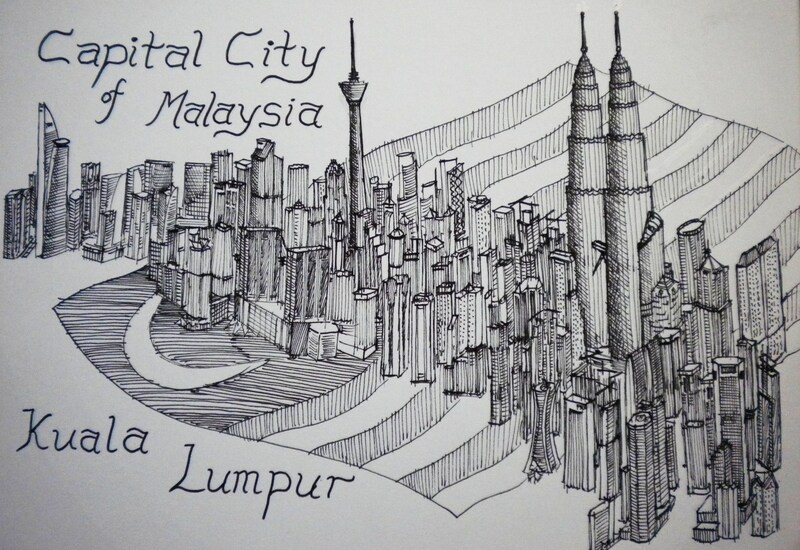 Probably I need do switch to other stuff to do…aah, my hobby comes again, sketching….not sketching design assignment, but sketching my all-time favourite, Kuala Lumpur city skyline from bird-eye view….simply sketch in around 30 to 45 minutes. 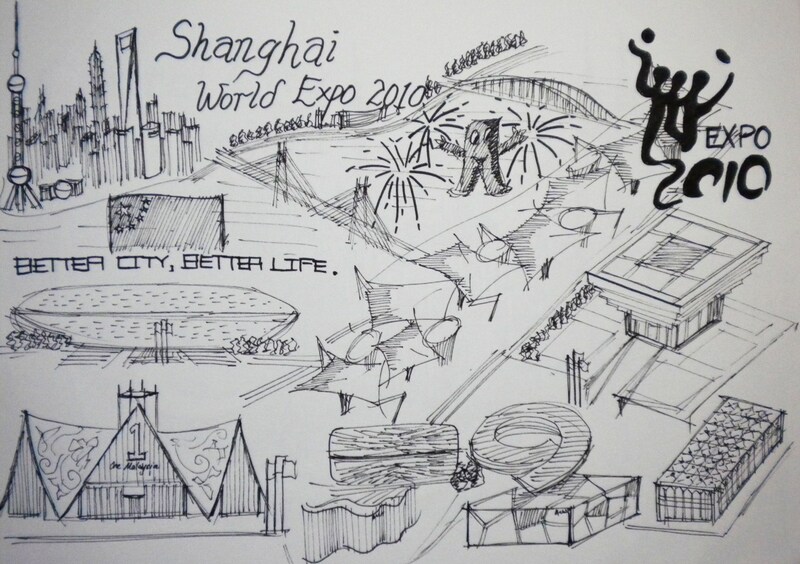 Next, time to sketch on the current Shanghai World Expo 2010, current popular global event going on in Shanghai from May till October 2010. This one is really very rough sketches….completed in only about 15 minutes…no mood sketch nice already on this…. After this, coming back to the idea-less design…oh my god! next week is already design submission, and I’m still so chill lately..what’s happening to me? I had still got time to watch movie, loitering around, watching tv, going night market, sightseeing, chit-chatting during these rush hours…. 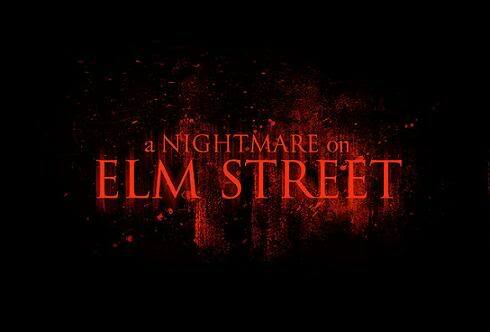 Today had finally been to cinema to watch the remake of classic horror movie, Nightmare on Elm Street. Didn’t watch the original one, now it’s time to catch up on the latest version. It is definitely worth watching especially for those who like horror film. The plot or the story basically captures your heart once you have seen it. It’s actually good that they reproduce this kind of classic horror film, since they have not much new ideas already. Sometimes, storyline from classic horror film is far more interesting and worth to be reproduced like this one. Spoiler ahead…don’t read if you wish to see the movie yourself….if you read also nevermind, it’s a just a brief synopsis of the whole film. It is about a man, whom is a gardener in a school attended by a group of children. He abuse the children and brought a child called Nancy to a secret place for his misdeed. His action is known by the parents whom then burnt him to death. As the children grow up, one by one of them is killed horribly in their dreams or most accurately, nightmares. The nightmare turned into reality, which meant that they are really being killed by the man called as Freddy Kruger. Their parents hide the past event from their children to erase the memories, but Freddy wished to bring it back. Finally, there is two teens left and they prevent themselves from sleeping to escape, but it is impossible. Lastly, they search for the truth and try to sleep to bring Freddy from dream to reality world to be killed. The acting by the artists in the film is very good, emotional and looks real, as though Freddy is really hunting them. There are some horror and heartbeating scenes in the film which might shock you suddenly out of nowhere. Hence, be prepared, and for those who are sick of all these, scared of terrifying scenes, scared of something ugly popped out suddenly, then don’t watch….there are some really ugly scenes in there, those killing parts…. Anyway, this movie is quite good, there is basically no boring part of it, and there is suspense every minute and then. After the movie, we ate at Sakae Sushi in Cheras Leisure Mall, the place we watched the movie too. 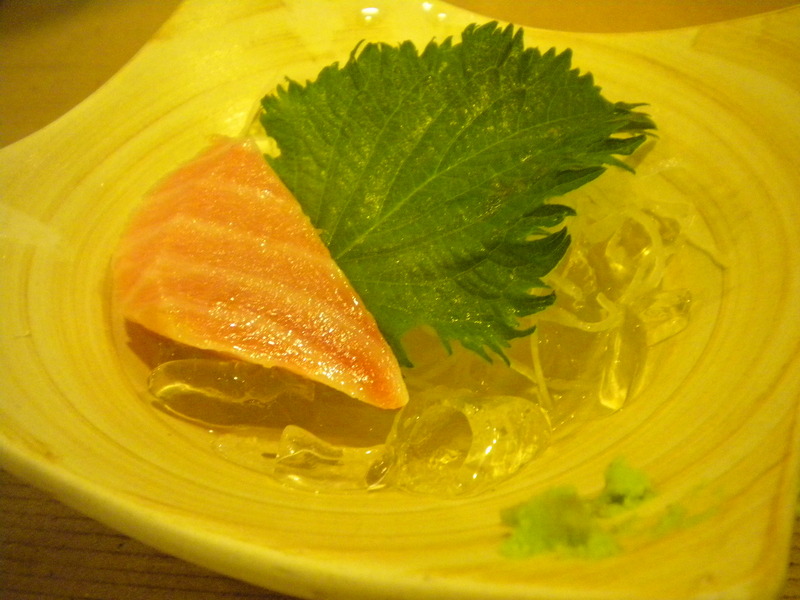 The Japanese food is quite good and makes you full eventhough it is only few plates of sushi. 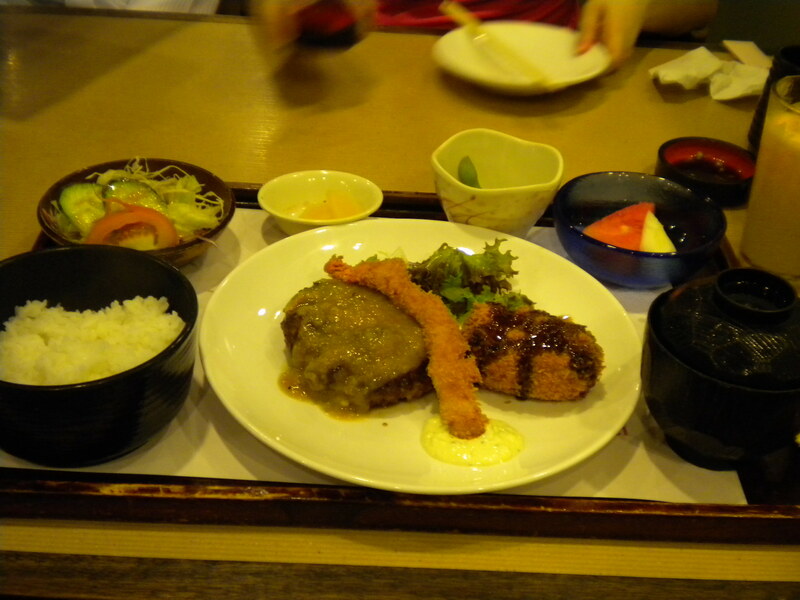 Ohh..have been eating Japanese food for two continuous days (check out my previous post too). Back to the movie, I think I talked too much on it already…haha….don’t sleep tonight, or Freddy will put you in a eerie place, hunting you and finally put his hand of knifes onto your body, anytime, anywhere, when you have slept…. Yesterday’s night, usual Saturday’s night would be thought as usual night with common dinner at common place nearby. It’s time to change to new place for special dinner yesterday’s night, eventhough there Is no special occasion to celebrate on. KL people usually didn’t go to KLCC, seems very new to that place, hardly been there, so when I was there, I was like a foreign tourist more than a local people, who stays in KL also….haha….wondering around, looking up to buildings around that area, overwhelmed by the night scenes of it. Can you spot the moon in the middle of the sky? Dinner came first, we went to Nippon Tei, famous Japanese restaurant in KLCC, and this is the first time I tried Toro Sashimi, raw toro fish’s meat. Not adapted or used to it, because it is the first time trying, but quite nice actually. Wait a minute….5 small slices of it cost RM80…wao….one slice costs RM 16 in one small bite with little wasabi applied. My set will be the unique mix grill set, which is of beef, tempura (prawn) and with other side dishes like salad, soup, fruit, etc. My set costs RM31. Quite worthy actually because it really taste good and delicious as well as in large amount, which is enough to make you full. 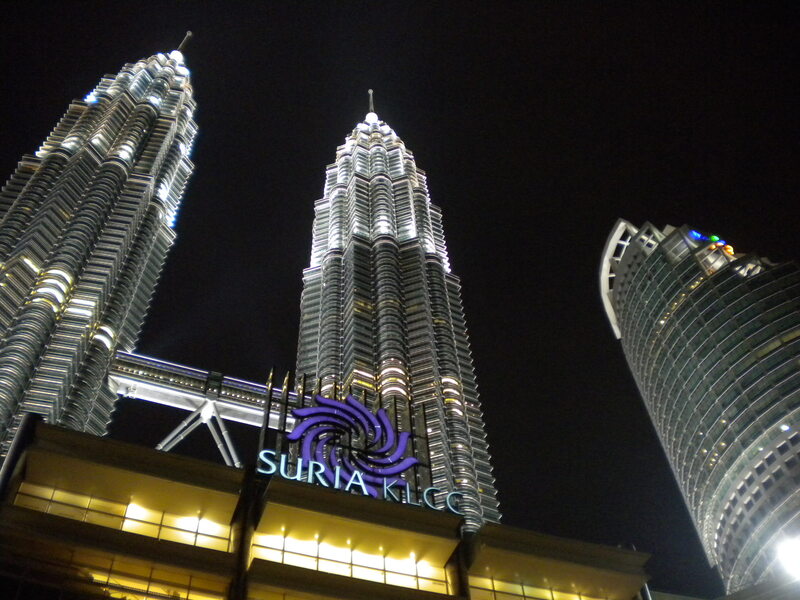 Time to walk to KLCC Park, the large recreational park right behind the twin towers. 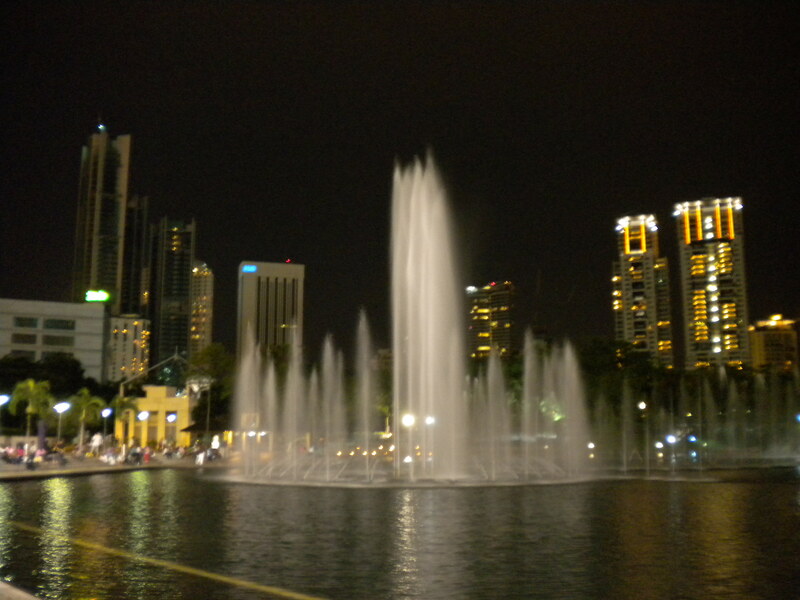 From here, many people are enjoying views, windy atmosphere and beautiful fountain display. And bravo…it’s time for me to take pictures, from this angle, from that perspective, from that location, from that point of view…had taken quite a lot, especially of the twin towers…. I noticed there are a lot of newly-built modern-style serviced apartments built around the area. One unit must be costing a large sum of money. Only the rich one can afford. 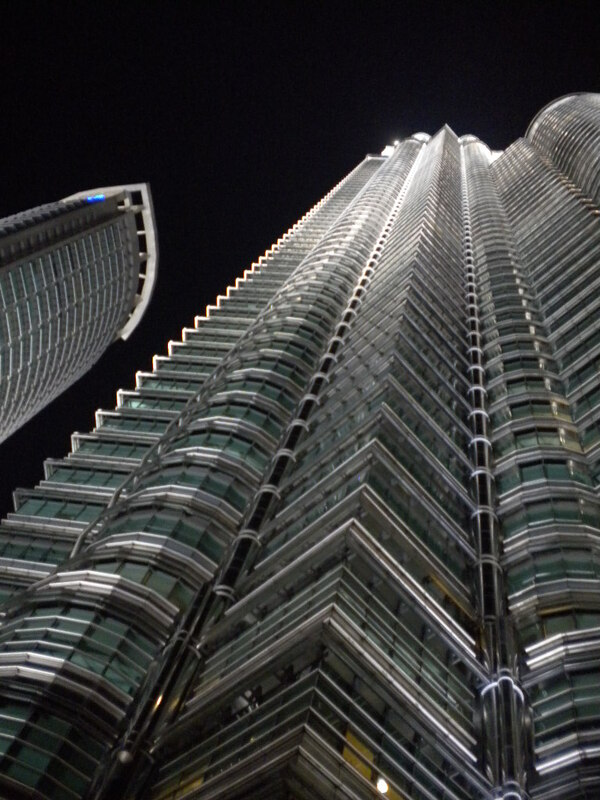 Not me, of course….haha…dreamed to have one, since it offers good view towards the twin towers. Many construction of highrises are seen too, around the area, like the Felda Tower (50 storeys), Naza Tower (50 storeys), Troika Tower (50 storeys), Charigali Tower(over 58 storeys) (Lot C of KLCC), Four Seasons Centre (over 70 storeys), etc. If you give me one full day till night, I can stand or walk around that area just to catch a glimpse of the beautiful skyline of Kuala Lumpur seen from that area. I can sketch on site too, if I’m given the opportunity. I love to see all these things, especially skyscrapers, which are my all-time favourite. Their height and scale overwhelmed me from all directions. 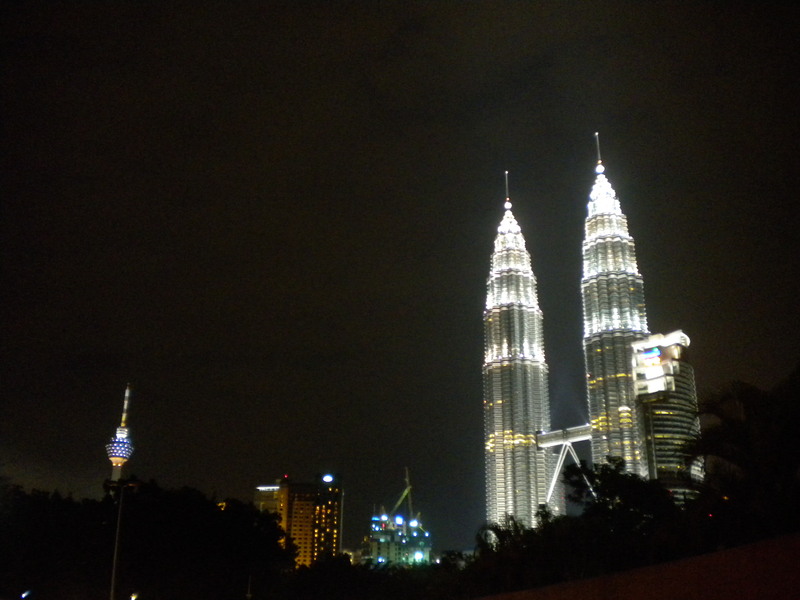 Love KL! Have been mentioning much on the overall Shanghai World Expo 2010 and on my country’s pavillion, Malaysia pavillion, and I think it’s time now to focus on the host nation’s pavillion, the grandest of all, and triple the height of other expo structures (pavillions). The China Pavilion, also known as the Oriental Crown, represents the spirit of the people of China and showcases a variety of sustainable building practices ranging from passive design to rainwater harvesting. The Oriental Crown is one of the 5 permanent green buildings on the Expo site, and it will be converted into a national history museum upon the conclusion of the expo next October. 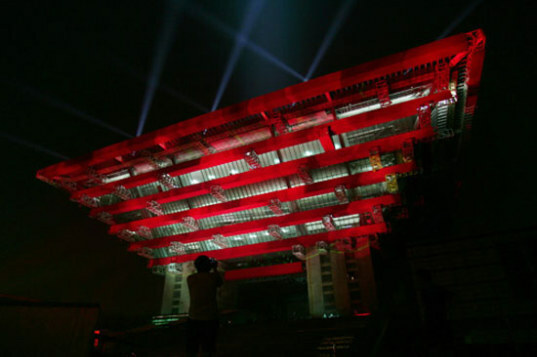 Coloured in Red, similar to main colour of Forbidden City, the structure represents the taste and spirit of Chinese culture. The construction of the pavillion took two years to complete. Numerous pavilions have been designed around the expo’s theme of “Better Life, Better City,” and many of the pavilions focus upon sustainable and energy-efficient building practices. The China Pavilion sits right next to the Expo Boulevard and the Sun Valleys, which act as the center of the Expo. Painted the same red as the Forbidden City, the Oriental Crown consists of four pillars with 6 floors expanding out and up. 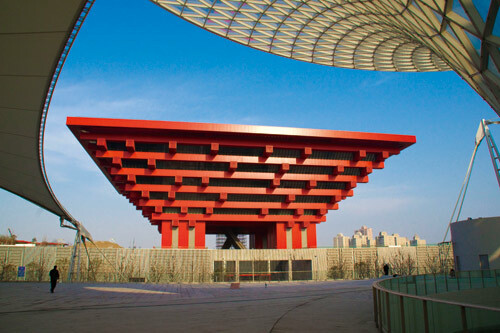 The 30 meter high roof is constructed from 56 wooden brackets, which represent the 56 minority ethnic groups of China. Additionally, nine folded scripts engraved on the surface of the building list the short names of China’s provinces. 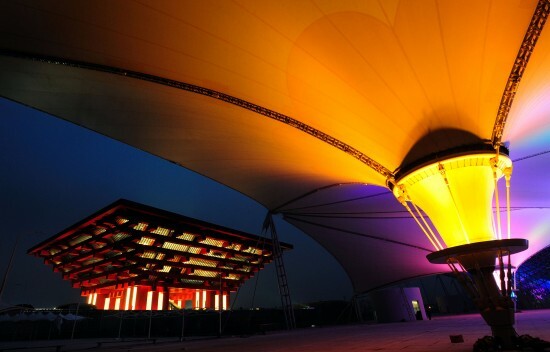 Designed by He Jingtang, the director of the Architectural Academy of the South China University of Technology, the pavilion includes many energy saving technologies. The exterior of the structure offers a temperature buffer zone and natural ventilation for the interior, and the inverted shape of the pavilion acts as shading for entire building as well as the courtyard below. The roof of the structure includes eco-friendly landscaping and harvests rainwater. The pavilion puts green concepts into action. Its inner halls reflect the traditional Chinese philosophy of “Humanity In Harmony With Nature.” Consisting of three sections — The Footprint, The Dialogue, and The Actions — the China Pavilion’s displays take visitors on a journey to discover the nation’s ideas on the evolution of cities. The exhibition also focuses on the low carbon lifestyle that could shape the future development of Chinese cities. It prominently displays the country’s proposed solutions to global challenges. But the biggest highlight might be the projected painting called “Along The River During The Qingming Festival.” It was painted during the Song Dynasty, some 700 years ago. Personally for me, I think it’s an impressive landmark, sitting on the large expo site. It is very visible from far, stood out proudly among other pavillions and expo structures. It is outstanding. However, the design is still not to its best. I think that it is still lacks of little essence of China. 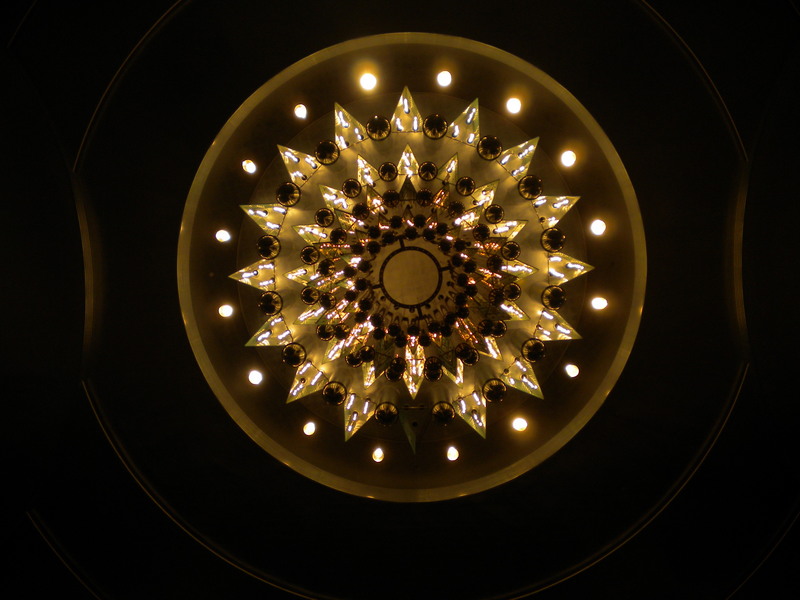 I’m curious why they choose Oriental Crown as design concept for the country’s pavillion. Any meaning behind it? Oriental Crown definitely shows power, is it means that China is showing its capability in hosting such global event and powerful in terms of economy? 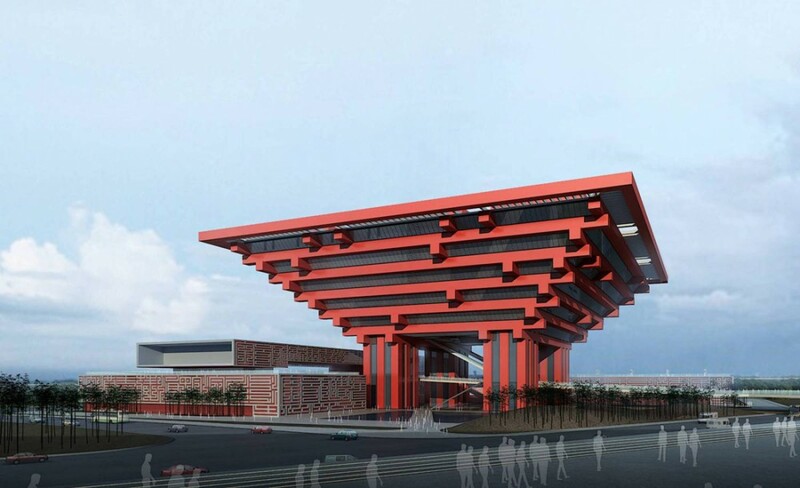 The architects are trying to translate the traditional Chinese architecture into modern pavillion like this, which is a good approach, but when it is mixed with political agenda, then it is architecture of politics! Anyway, it is still a good design that definitely represents China. 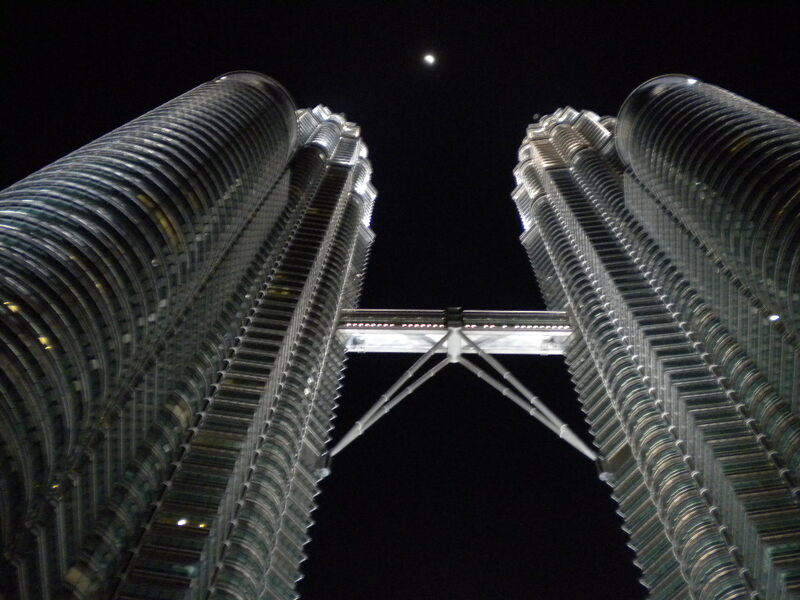 Malaysia’s competitiveness ranking surged into the top 10 in the world as Asian countries took the first two spots after financial turmoil and an economic crisis saw previous leader, the United States, slipping to third place. Malaysia’s competitiveness ranking rose to 10th, from 18th a year earlier, as the country benefited from strong demand from Asia as well as implementation of efficient policies, especially government policies, said the latest IMD World Competitiveness Yearbook 2010. IMD said Singapore, ranked as the most competitive economy, and Hong Kong displaced the United States off the perch as the two Asian countries displayed great resilience through the recent economic and financial crisis. Malaysia, which is now ranked the fifth most competitive country in Asia Pacific, scored highly in business and government efficiency.The rankings are tabulated based on four main criteria; economic performance, government efficiency, business efficiency and infrastructure. Can’t imagine that my country, Malaysia had made it to Top 10 in world ranking. It is unbelievable that mainland China did not make it to top 10, probably because only economy in some cities like Shanghai, Beijing, Shenzhen, Guangzhou, Chongqing are developing, while many others in China (majority) are still experiencing slow economic development. US had dropped the ranking further down, from top spot, to number two, and finally, this year to no.3. Many Western countries are out of the top 10 list, especially on Europe region. This quote definitely is proven;‘The downfall of the West and the rise of the East’. Not to point finger on the Western countries, but it is seen clearly that Western countries’ economic are progressing very slowly now compared to Asian powers like China, Singapore, etc. Maybe the West have developed to its fullest during decades ago, while this is the current time for Eastern countries to shine.